In the lead up to the 2016 SHOT Show in Las Vegas Jan 18-22, the National Shooting Sports Foundation says growth in the industry is unsurpassed and women especially account for greater numbers of new gun owners then ever before. 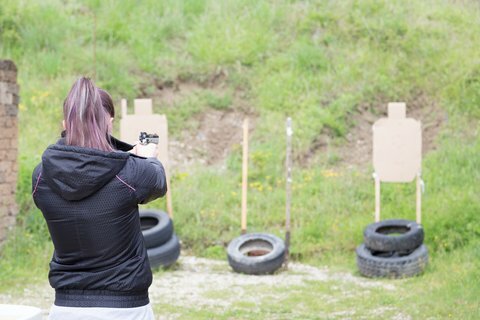 In a survey of women who owned at least one gun, researchers found their primary motivating factor was self-defense. The most commonly owned firearm among women (56 percent) was a semi-automatic pistol. When the foundation asked its member retailers about women gun owners, 74 percent said the numbers of women customers had increased. According to the National Sporting Goods Association, female engagement in target shooting grew 60 percent to 5.4 million participants between 2001 and 2013, and was up 85 percent for hunting to 3.3 million participants during that same period. “The women’s market is a force in our industry, and manufacturers, retailers and shooting ranges are making changes to their products and services to satisfy women’s tastes and needs,” said Jim Curcuruto, NSSF Director of Industry Research and Analysis in a press release. As recent media reports can attest, gun purchases in America have been on an upswing with latest fears of terrorism, economic difficulties at home and a perceived threats to the Second Amendment. For the shooting sports industry, the gains have been unprecedented. Gun manufacturers and retailers have created nearly 35,000 jobs in the past two years for a total of 263,000, all factors included, and a combined economic impact of nearly $43 billion, according to a recent economic report commissioned by the NSSF.